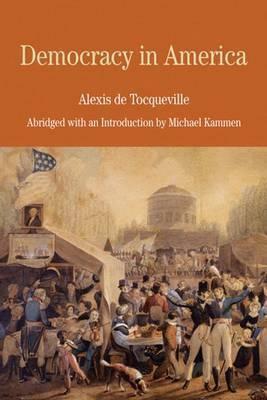 Designed for instructors who are eager to teach Tocqueville's classic study of American politics, society, and culture but reluctant to assign all 700 plus pages, Kammen's careful abridgment features the most well-known chapters that by scholarly consensus are most representative of Tocqueville's thinking on a wide variety of issues. PART I Introduction: Tocqueville's Democracy in America.- Tocqueville's Life and Character.- The Journey in America.- Content and Key Themes of the Work.- How Democracy in America Was Received.- The Relevance and Legacy of Democracy in America.- PART II Author's Introduction.- The Influence of Democracy Upon the Intellectual Development of the United States.- Influence of Democracy on the Opinions of Americans.- Influence of Democracy on Customs as Such.- The Influence of Democratic Ideas and Attitudes on Politics.- APPENDIXES.- A Tocqueville Chronology (1805-1859).- Questions for Consideration.- Selected Bibliography.- The Bedford Series in History and Culture. MICHAEL KAMMEN (ed.) is Professor of American Cultural History at Cornell University, USA.